s a follow-up to yesterday's glass marble magnets post, I spent today cutting little tiny circles to finish off the magnets I was making. These cuties are going into my office. I still haven't tried the thumbtack idea yet, but I still have plenty of marbles to try it later. I separated them out by paper background type to make it easier to see the different ones. To make these I cut out circles of scrapbook paper that will work well in my office about the size of the back of the marble. I coated the back of the marble with Mod Podge, applied the circle to the Mod Podge. Then I applied another coat of ModPodge careful to apply it just a smidge over the edge of the paper as well to help it adhere. After it dried I glued a magnet to the back with LocTite super glue. I also made a paper punch and paint version yesterday. I submitted this post to Paper Craft Thursdays at Kelli's There is no place like home, go there to see more projects, she makes the cutest cards! My daughter made these magnets with her youth group years ago. I have forgotten about them. Yours are so cute, I'm going to make some for my filing cabinet at work. Thanks for the great idea. These are completely darling. I am so going to save (bookmark) this for a rainy day crafts project for Miss Emi (when she's a bit older). Also, what a great gift for grandma's, teachers, fav aunts, etc. Love it!! Barbara, your magnets are gorgeous. I love the papers that you chose. It makes me want to go and make some more. I went and bought tons of the square marbles last week. Love the little round ones you made. Cute stuff. Sandra: I love how you can make them to match your decor... so cute! Traci: Thank you for the idea and the compliment! I tried to find square marbles here, but no luck! Adorable! Love the colors you picked to use. I love your magnets. They would make great gifts too! What cute magnets, I am going to have a go , never tried this before so thnkyou for the inspiration. Your magnets are cute. I've made those before too, only I glued stickers to the back of the clear rock...or I've also used clear cubes and then the sticky part stuck to the magnet. I like yours better though. Thanks for sharing. 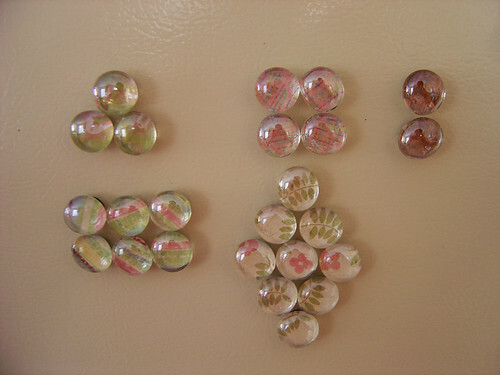 That is such a neat idea...your magnets are very pretty! Thanks for all the compliments!! !